The sky rambles with impending rain?droplets hiss in the blasted air before reaching the parched ground. A leviathan bursts through the clouds, its silver scales glinting in the crimson sun. The rain drake pauses, then moves in with jaws opened wide? Only the bravest-or the most foolhardy-would dare stand before the creatures included inside this Monstrous Compendium appendix. Encounter the shadow giant, the stalking horror, and the unique undead found lurking beyond the Tablelands as well as many other terrors. Containing 128 pages of full-color monsters, this accessory is designed for the Dark Sun campaign world but is adaptable to any AD&D campaign. Dark Sun Monstrous Compendium Appendix II: Terrors beyond Tyr (1995), by Jim Atkiss, Steve Brown, Timothy B. Brown, Andrew P. Morris, Bruce Nesmith, Wes Nicholson, and Bill Slavicsek, is the second Monstrous Compendium for the Dark Sun setting. It was released in February 1995. Continuing the Monstrous Compendiums. The AD&D 2e era (1989-2000) was the richest period ever for D&D monsters, most of them setting specific. Starting with MC1: Monstrous Compendium Volume 1 (1989), TSR released fifteen different looseleaf collections of monsters. Then, after the release of the hardcover Monstrous Manual (1993), TSR published seven more setting-specific monster books — all of them now bound collections. Terrors beyond Tyr was thus the 22nd of the traditional Monstrous Compendiums for AD&D 2e (or the 23rd if you include the Monstrous Manual) — and the last in this style! A motley collection of related books followed. Savage Coast Monstrous Compendium Appendix (1996) was an online-only release, while a series of Monstrous Compendium Annuals (1994-1998) reprinted monsters from other D&D publications and continued for a few more years. Together they brought the total count of 2e monster books to somewhere between 26 and 28, depending on which you choose to include. However the Dark Sun Monstrous Compendium marked the beginning of the end for the great monster epoch of D&D history. As the name suggests, Appendix II: Terror beyond Tyr was the second Monstrous Compendium for the Dark Sun setting. 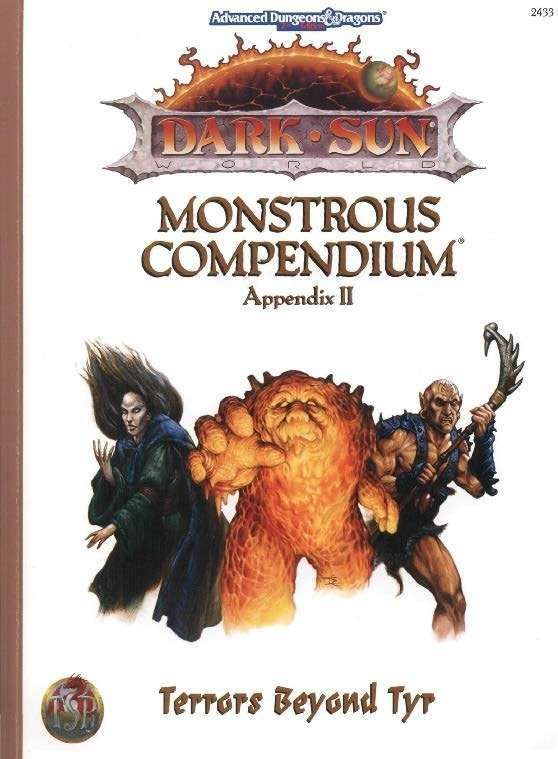 The previous one was a looseleaf releases, MC12: "Monstrous Compendium Dark Sun Appendix: Terrors of the Desert" (1992). Continuing the Dark Sun Series. "Terrors beyond Tyr" was also a pivotal release for the Dark Sun line, as it marked the beginning of a transition into the wider world of Athas. As the book states, it's for gamers "venturing into the wilds beyond the Tyr region". This was a continuing theme throughout 1995. Thri-Kreen of Athas (1995) hinted at the Tohr-Kreen empire beyond the Jagged Cliffs, while Beyond the Prism Pentad (1995) moved Athas' timeline up past the Prism Pentad novels (1991-1993). However, the Dark Sun line would only complete its jump to this larger world with the release of Dark Sun Expanded and Revised (1995) late in the year — and with later supplements such as Windriders of the Jagged Cliffs (1995) and Mind Lords of the Last Sea (1996). Expanding Athas. By detailing monsters from beyond the Tyr region, Terrors beyond Tyr took the first step in enlarging the world of Athas. Monsters of Note. The most notable of the monsters in Terrors beyond Tyr may be the Athasian Aarakocra, a race of flying beings making their first major appearance in Dark Sun. When first detailed in Fiend Folio (1981), they were the kin of eagles, but now they were instead linked to vultures. Ah, how the mighty fell in Athas! The Aarakocra would continue to be mentioned throughout the brief Revised Dark Sun era. Beyond that, Terrors beyond Tyr includes a combination of unique, never-before-seen Athasian critters and reprints from previous Dark Sun books. Thus it contains everything from the ever-popular cilops and crodlu to the brand-new hunting cactus. The elemental beasts, the paraelementals beasts, and the shadow giant are some of the more notable new monsters, while the draconian dray reappear from City by the Silt Sea (1994). Some effort was also made to expand upon singleton monsters from previous books: the silt drake reappears from DSR4: "Valley of Dust and Fire" (1992) and is joined by a magma drake, rain drake, and sun drake. Similarly the magma golem from that volume is joined by a salt golem. One of the most unique elements in Terrors beyond Tyr is its inclusion of monster stats for PC races like dwarves, elves, half-elves, half-giants, halflings, humans, and thri-kreen. Entries of this sort can invoke the evocative character of a setting, but they were a rarity in the Monstrous Compendium series. Monstrous Compendium Volume One (1989) included numerous human stats, as did one of the Dragonlance volumes and a few of the Ravenloft volumes, but they weren't standard for the series. Finally, Terrors beyond Tyr also contains an article on the unique undead of Athas, with rules for customizing their special powers and their weaknesses. Future History. Fans at athas.org revamped some of these monsters in a 3e PDF called "Terrors of Athas" (2004), which was released as a playtest preview. Some of the creatures later returned for 4e in the Dark Sun Creature Catalog (2010). About the Creators. As with many of the Monstrous Compendiums, Terrors beyond TYr was the work of a wide variety of creators. 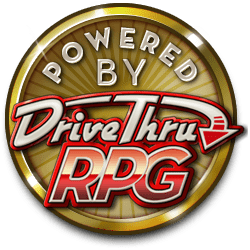 The history of this product was researched and written by Shannon Appelcline, the editor-in-chief of RPGnet and the author of Designers & Dragons - a history of the roleplaying industry told one company at a time. Thanks to Robert Adducci for Dark Sun advice. Please feel free to mail corrections, comments, and additions to shannon.appelcline@gmail.com. This title was added to our catalog on September 02, 2014.